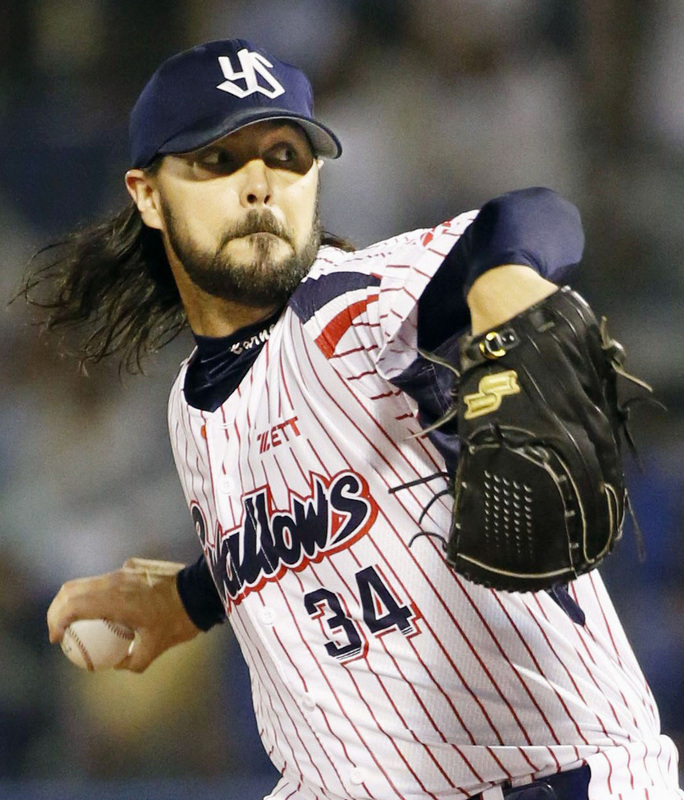 The last game pitcher Tony Barnette ever started for the Tokyo Yakult Swallows came against the Chunichi Dragons on March 8, 2011, during spring training. Barnette had already had one life-altering moment that spring — he’d proposed to now-wife Hillary before leaving Arizona for Japan — and, though he didn’t know it, another was right around the corner. He was messing around with a cutter that day and noticed the Dragons’ power hitters were having trouble getting their bats on it. Junji Ogawa, Yakult’s manager at the time, and pitching coach Daisuke Araki saw this as well. 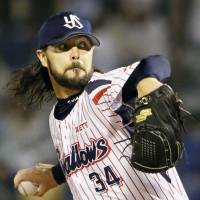 Barnette had joined the Swallows as a starter in 2010, but was cut after going 4-5 with a 5.99 ERA in 16 appearances (15 starts). The team quickly re-signed him, however, and now Ogawa had an idea. Ogawa and Araki approached Barnette after the game. They didn’t get to the point of the meeting right away, taking a more circuitous route, as they perhaps tried to gauge Barnette’s reaction. Eventually they got down to business. The Birds needed help in the bullpen, and Ogawa and Ararki wanted to try Barnette out as a reliever. Barnette, who trusted his coaches, didn’t need much convincing. Which was lucky for everyone involved, especially since the move looks like such a no-brainer in retrospect. “They moved me to the bullpen, and at that point I was like, ‘OK, new life. Here’s the bullpen, it’s a new role, it’s a new game, start from scratch, let’s just make it up,’ ” Barnette, who recently signed with the Texas Rangers, told The Japan Times over the phone. “That’s pretty much what I did. I got rid of my wind-up, started throwing some different pitches, started playing with the cutter, started moving to the sinker and the split stuff. Relieving was like a revelation, and it didn’t take long for Barnette to breathe new life into his career. Barnette’s conversion into a reliever has him on the cusp of his dream to pitch in the majors. He was drafted by the Arizona Diamondbacks in 2006, and made it as high as Triple-A in that organization. After six seasons in Japan, he signed a two-year deal with the Rangers earlier this month. Barnette, 32, made 244 appearances for the Swallows from 2011-2015, leading the Central League in saves with 33 in 2012 and finishing tied for the NPB-high with 41 last season. He was credited with 97 saves and 49 holds over that span and struck out 266 batters. He was a key part of the Swallows’ run to the Central League pennant in 2015, making 59 appearances and striking out 56 over 62⅔ innings. In addition to his save total, Barnette finished with a 0.90 WHIP and 1.29 ERA. The next challenge will be keeping it going in the big leagues. Barnette made a lot of adjustments to his game while in Japan. In the bullpen, he added some new weapons, such as a cutter, sinker and shuuto. He even picked up a Japanese-esque motion in his delivery, which he’s said he’s taken some good-natured ribbing for in the past during workouts back home in the offseason. Repatriating into the Western style of baseball will take an adjustment, but Barnette expects to apply many of the lessons he learned from his time with Yakult in the majors. Barnette learned a lot on the field, but also left Japan with a new outlook and purpose in life away from the diamond. Those lessons may also come in handy on the road ahead. “I came over as a 26-year old with a girlfriend who was still in college back in the States,” Barnette said. “Now, I leave Japan as a 32-year old married man with one kid and another kid on the way. Barnette said it was a relief when the deal with Texas was finalized. He said the reality of the situation probably won’t really hit him until late January, when he would normally be heading to Japan for the Feb. 1 start of spring camp. While Barnette points out that he hasn’t done anything in the majors yet, he’s excited to finally get an opportunity. “For me to get to this point, its hard work paying off,” he said. “I never let the low times get too low, because that’s baseball, that’s life. Things go wrong. I just kept pushing forward, kept showing up, kept working hard and here I sit right now.